Toufayan’s Crispy Breadsticks are baked in the same tradition of quality as all of our other fine bakery products and are available in a variety of delicious flavors to complement soups, salads and dinner entries. Perfect with soups, salads, dips or alongside cheese or fruits. Or, grab a handfull and enjoy them all by themselves. Bought crispy Breadsticks from local meat market in Fort Gratiot, Michigan. Some of the breadsticks were burnt. Upc code is 70704 00183. Should I return them to store? Thanks for bringing this to our attention. We will have our Quality Control Department look into it right away. As far as returning the item, it is up to your local grocer’s return policy. You may be able to try and exchange them for a different bag. Thanks for your interest, Kathy. Please ask your favorite grocer to add Toufayan Crispy Breadsticks to their inventories or to contact us directly. I love your everything breadsticks, but they are hard to find in the Phoenix A area (sometimes see them in Basha’s.) But I have been having my sister send them from Louisville KY. SHe is traveling for a while and the only other source I know is Amazon, but they say unavailable, restock date unknown. HELP I am addicted to them and have 4 sticks left! Hello Harriet and thank you for your interest in our Crispy Breadsticks. In Arizona, Some Albertsons Stores carry our Crispy Breadsticks, but it is up to each store manager to decide what products and varieties they stock. Use our store finder for more details and areas. I had a local bakery ship to me Sesame breadsticks from New York to Puerto Rico until the family business closed. The Toufayan Sesame Breadsticks is the closest I have found. My local supermarket in Puerto Rico only carry your bagels and croissants. I have asked them to order the Breadsticks but they say the item is to delicate and gets crushed. The stores are Mr. Special and Econo. Are there any other stores that offer this product. I am willing to order an entire box (12 + bags) since they remain fresh when frozen. Please help since this is a staple of my breakfast everyday. You can find Toufayan Crispy Breadsticks in Albertsons, GFS Marketplace and Publix in Florida. D’Agastinos, Fairway, Foodtown, Gristedes and Stop&Shop carry them in New York. You can use the store finder to find more stores. Please feel free to reach out, or have your contact reach out to a sales associate directly. If they have concerns or shipping requirements, we may be able to help them. As for shipping internationally, we have not done any such shipments, but we do have a major facility in Florida so there may be something we can work out. I just tried your product for the first time. I purchased the everything bread sticks and wanted to say that they are the best bread stick I ever tasted. I am crushed because my local grocery The Andersons in Maumee, Ohio is closing and I’m desperate to find out where to buy your Everything breadsticks. Can you help me out? I love your products!! We’re so sorry to hear that Sara! Please don’t be crushed! Ask the store manager of your favorite grocer to add our Hearth Baked Breadsticks to their inventories. You can give them our contact information. You can also try stores like Walmart, Meijer and Big Lots who carry our products but vary widely as to the varieties they make available in each region. Spartan Stores, Shop n’ Save and Remke Biggs all carry breadsticks in Ohio, though they all seem to be beyond your immediate vicinity. Please take a look at our store finder – sometimes a store will carry our products, but due to changes in their own distribution, the varieties listed here aren’t as up to date. If they do have some of our products, they are more likely to add more if you show your interest! Please let us know if you still have trouble or if any stores in your area are carrying breadsticks. So sorry we missed your comment! If haven’t already been in touch with a Toufayan representative, please call or email us at the bakery and we’ll see if we can help you out! 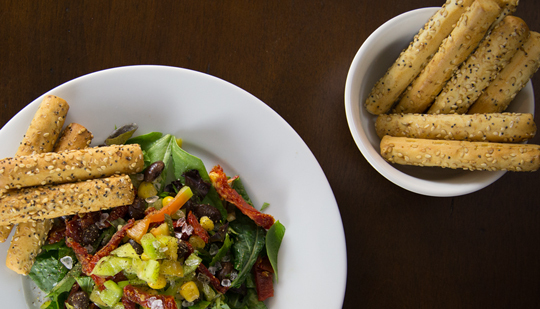 We’re sorry that you can’t find our Crispy Sesame Breadsticks anymore. Please ask your store manager to stock them again. You can try other Publix stores in your area, each store may decide to carry different varieties. You might also try Albertson’s or Walmart. Please let us know if you still have trouble finding it, or share with our community where you do find these breadsticks in your area. Our local meijers store does NOT carry these ! How can we get them here ?Angola IN. 46703. Please ask your store manager to carry your favorite Toufayan products. Meanwhile, you can try your local Spartan Stores, such as Bunch’s Shop Rite. Be sure to let us know if you still can’t find our Crispy Breadsticks in your area.